www.busybuddybooks.com opens the doors to a wonderland of colorful enjoyment and adventurous amazement! Along with Flynn the Flying Squirrel, the cute and cuddly lead character in all Busy Buddy stories, your child will be able to go for fun jungle adventures, learn about new animals, and even sing a song or two. This company has gone the extra mile in creating an approach to storytelling that customizes the characters in the story to that of the child reading it. The parent is able to create their own book wherein their child is one of the characters in the book and actually a part of the story. Busy Buddy Books needed a colorful cyber face to the world that could perfectly capture the childlike fun and adventure that the company stands for. Because children are the primary audience of all Busy Buddy adventures, the site had to cater entirely to the imagination of a child. It had to sport colorful characters, bold texts, eye-catching fonts, and even upbeat music! Busy Buddy also required an easy system for parents to create a book, preview it, and then order. Coincidently, Pulse Solutions was up for just such an adventure as well! The website was then specially designed after all Busy Buddy needs. With a backdrop of sky blue and floating dreamy clouds, the website was programmed using .Net/MS SQL 2008/Ecommerce. Colorful characters from Busy Buddy stories were featured on the homepage, and illustrations along with a dash of easy navigation allow parents to create characters of their own. 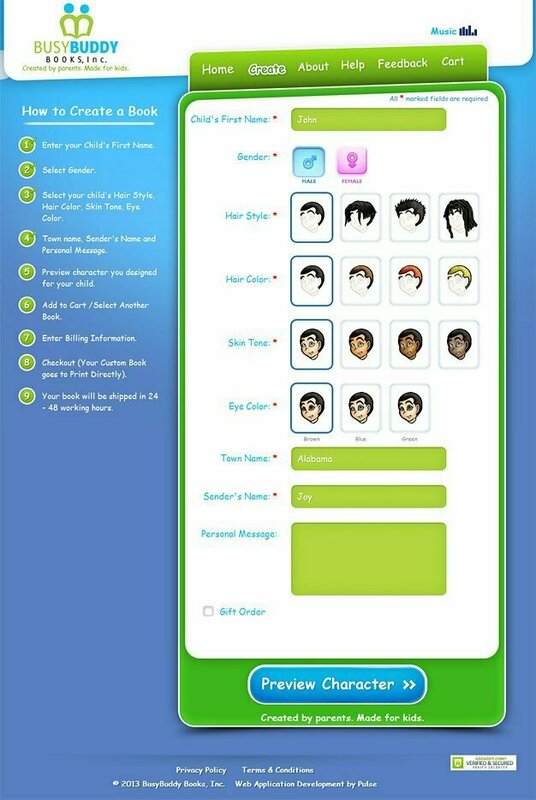 Pulse was able to create a simple system for how to customize a book through filling in and choosing various options, like the child’s name, gender, hairstyle, hair color, skin tone, and eye color. The parent is then able to fill in address details and have the book personally delivered to them. This approach made it easy for these books to also be used as unique birthday and Christmas gifts from friends and relatives. Pulse is proud to have created a website that is dedicated to children the world over. We at Pulse believe that to safely travel a journey of a thousand miles, seek adventure in the pages of a book.